bløgg.no » Blog Archive » SSH outbound connections – what are they trying? Still fascinated by the outbound connection attempts from my Cowrie honeypot, I’ve been looking into what the intruders are trying to obtain with the outbound connections. As previously mentioned, there are bots actively attempting outbound connections towards a lot of remote services. Most are simply TCP socket connection attempts, but now and again the connection attempts hold payload data. Payload for encrypted services (SMTPS, HTTPS etc) is already encrypted. That leaves the plaintext services, mostly SMTP and HTTP. 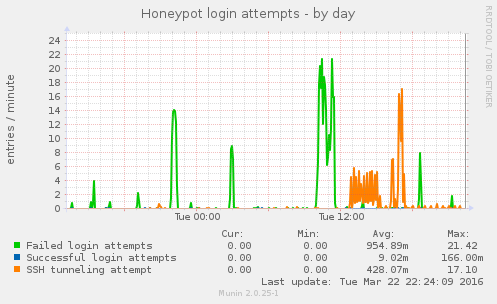 The following Munin graph shows today’s activity. At their busiest, the Russian bots performed outbound connection attempts at a rate of 17 attempts per minute (one per 3-4 seconds). The remaining attempts described here are HTTP requests. The requests are for the web root (GET /) unless otherwise noted. All requests have more headers than what’s shown here, I’ve pruned the less interesting ones for readability. Then there are some attempts to reach URL shorteners. Ignoring the fact that these headers are crafted, the Google referers are obviously fake since a Google HTTPS search will not pass the referer to an HTTP site. They’re also trying to connect to Craigslist. These attempts have started to appear the last few days. Note: Parts of the URLs are obfuscated.